Rock gardens can be planted on a naturally rocky slope or can be fabricated by importing rocks into the landscape. Elevate the garden by layering rocks and soil, taking care to position the rocks so they control erosion and allow pockets for planting. Use smaller rocks as mulch around the plants. The kinds of plants that are typically used in rock gardens are those that are naturally adapted to rocky or alpine environments and poor, well-drained, drier soils. 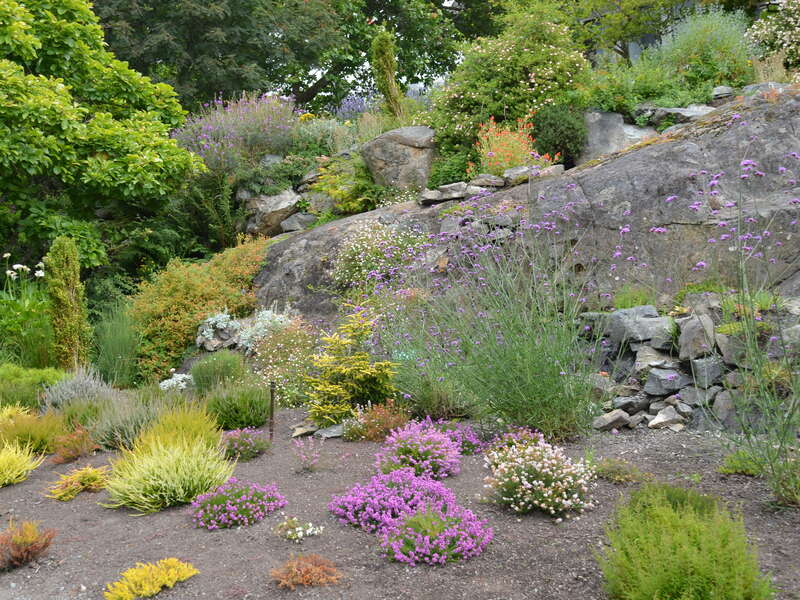 Low growing, clump forming perennials are ideal candidates for rock gardens. They include: Hen & Chicks (Sempervivum), Pinks (Dianthus), Candytuft (Iberis), Rock Cress (Arabis), Sea Pinks (Armeria), Silver Mound Artemisia, Creeping Phlox, Creeping Thyme (Thymus), Violets (Viola), and Stonecrop (Sedum) among others.